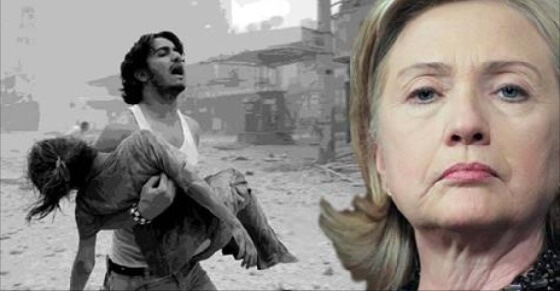 A leaked Hillary Clinton email has now confirmed that the Obama administration, with Hillary directing policy, orchestrated a civil war in Syria to benefit Israel's geopolitical interests and stability. 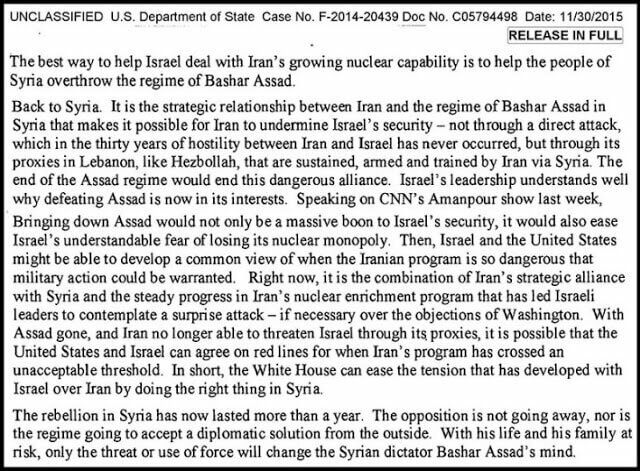 The new Wikileaks release shows that Clinton, then Secretary of State orchestrated the war in Syria to overthrow the government of President Assad, because it is “best way to help Israel”. The document was one of many unclassified by the US Department of State under case number F-2014-20439, Doc No. C05794498, following the uproar over Clinton's private email server kept at her house while she served as Secretary of State from 2009 to 2013. The email makes it clear that it has been US policy from the very beginning to violently overthrow the Syrian government—and specifically to do this because it is in Israel's interests. “The best way to help Israel deal with Iran's growing nuclear capability is to help the people of Syria overthrow the regime of Bashar Assad,” Clinton forthrightly starts off by saying. Even though all US intelligence reports had long dismissed Iran's “atom bomb” program as a hoax (a conclusion supported by the International Atomic Energy Agency), Clinton continues to use these lies to “justify” destroying Syria in the name of Israel. She specifically links Iran's mythical atom bomb program to Syria because, she says, Iran's “atom bomb” program threatens Israel's “monopoly” on nuclear weapons in the Middle East. If Iran were to acquire a nuclear weapon, Clinton asserts, this would allow Syria (and other “adversaries of Israel” such as Saudi Arabia and Egypt) to “go nuclear as well,” all of which would threaten Israel's interests. Iran's nuclear program and Syria's civil war may seem unconnected, but they are. What Israeli military leaders really worry about — but cannot talk about — is losing their nuclear monopoly. It is, Clinton continues, the “strategic relationship between Iran and the regime of Bashar Assad in Syria” that makes it possible for Iran to undermine Israel's security. The end of the Assad regime would end this dangerous alliance. Israel's leadership understands well why defeating Assad is now in its interests. Bringing down Assad would not only be a massive boon to Israel's security, it would also ease Israel's understandable fear of losing its nuclear monopoly. With his life and his family at risk, only the threat or use of force will change the Syrian dictator Bashar Assad's mind. Clinton's public assertion that, if elected president, she would “take the relationship with Israel to the next level,” would definitively mark her, and Israel, as the enemy of not just some Arab states in the Middle East, but of all peace-loving people on earth.